Honestly, my posts come spuriously because I’ve learned that just because you retire from the grind of going to work in hopes of having more time to do the things you want to do; you actually wind up being EVEN MORE busy! I’m trying to do better, though. This month, I hope to purchase my new mobile unit so I can write posts on the fly, while on travel. I started this blog a couple of years ago to write and share my thoughts, travel experiences, music selections and recipes. Writing is a constant challenge, since I’m quite dyslexic but because of that hurdle, I’ve come to appreciate writing on a much deeper level than the average person, I think. As a photographer, I like to provide a visual experience of what I see and do. I have started putting together a photo gallery in my home with favored images I’m actually selling! In the near future, there will be a link to the new site where images that are for sale can be viewed! It’s all really a dynamic and evolving thing here and I am glad folks enjoy what I share. For those who would like to begin a blog, start out by researching WHAT you want to primarily blog about, read others blogs to see HOW they have their site and learn how to build your own site. It really is quite simple! Wordpress has a lovely tutorial with all kinds of advice on how to construct your site. The next best thing I can pass along to new bloggers is to keep it simple and be honest! Each and every one of these folks has provided me with their unique perspective, talents and enjoyment via photos, music, poetry, paintings, recipes, advice and a whole slough of different thoughts. 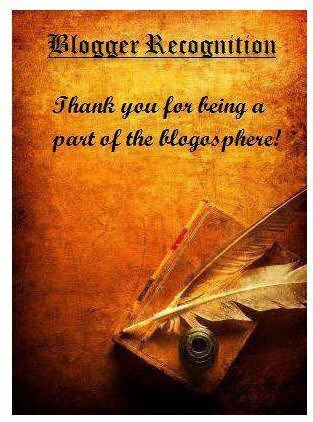 So,keep blogging! Choose 15 other bloggers to nominate, excluding yourself and the folks who nominated you. Include a brief history of how your blog was started. Provide some Pearls of Wisdom to new bloggers. Thank the person(s) who nominated you and include a link to their blog(s). Attach the award to your blog. Inform the folks you’ve nominated via comment on their blog site. Include a link to the award provider. I look forward to reading more of everyone’s posts! Greetings from the Pacific Northwest, Swav! You are welcome, my friend. My fingers need a break!! But when I got an online nod from Steven Tyler & Joe Walsh? It was word EVERY WORD TYPED all weekend! LOL. You are welcome! Wow! Steven Tyler and Joe Walsh? That’s huge! I’m heading out to visit grandkids in San Diego for a week, tomorrow morning early. Won’t have regular access to a computer for that time. I need a mobile unit! I’ve been shopping around for one but I make these kinds of purchases very carefully. Anyway, rest your digits…..
Now, I don’t know or can find your first name?? I feel weird just calling you Island Girl…LOL. Steven & Joe…. I KNOW!! COOL Right? They played last night at the Rally. Check all the photo’s I shared on my recovery blog posts the last few days. All my Facebook pals were sharing all the photo’s while they were performing. Sheryl Crow and The Fray played too! I go by Becky Ann ~ first and middle name….I have tons of Navy friends and a bunch of family down there and my all time favorite haunt is Catalina Island. I kind of grew up down there having lived in Montclair and the Mission Viejo…before moving up to Idaho in my teen years…..Then, there is a lot of time spent living down there because of Navy schools….Yep, I know the area, mostly by bicycle since I’ve only driven in the area ONCE (my last trip down)….All of the other times I lived or visited there, I rode bicycle virtually everywhere! Was a So. Cal. girl once! Now I rooted in the PNW and happy about that! Geez! You got your “music” on! That’s great! I’m jealous but also happy for your rally and the success of it. Anyway, getting ready to go now. You won’t see much activity here unless I can find a system to log onto….. Thanks for the nomination, and mentioning my blog in your post. It’s always nice to get positive feedback from readers who enjoy the music on my blog. It is, and you’re welcome!